BYD, China's world-leading company in the production of pure electric buses has held a ceremony to mark 20 years of doing business in Europe. Since December 1998, BYD Europe has been operating in Schiedam, part of the Greater Rotterdam area in the Netherlands, offering green solutions for public transport with great success throughout the entire European region. At the ceremony, speeches were delivered by Isbrand Ho, managing director at BYD Europe, Zhang Guosheng, economic and commercial counselor of the Chinese Embassy in the Netherlands, and Cor Lamers, mayor of Schiedam speaking on behalf of the city of Rotterdam. Barbara Kathmann, vice mayor of economic affairs for the municipality of Rotterdam joined the reception, together with clients, suppliers, and other people engaged in a business relationship with the company. 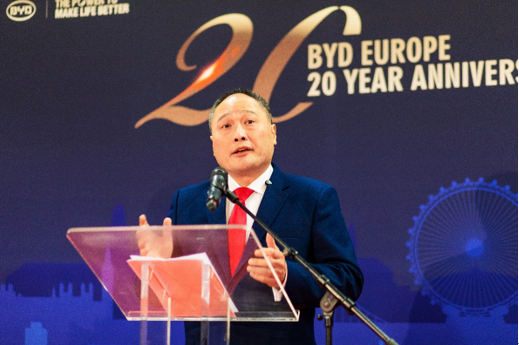 Isbrand Ho said celebration of the 20th anniversary was "part of the bright future for BYD's 'new energy solutions' across Europe, driven by battery technology and the need to clean up the air we breathe. The embassy representative, Zhang Guosheng,said that, during the past 20 years in the Netherlands, BYD had made some outstanding achievements. "Starting off as a battery supplier with only a few employees, you have now expanded into a fast-growing business with more than 60 employees, representing solar, energy storage and electric vehicles, and were awarded the 'Invest in Holland' certificate by Dutch government. We are proud you have grown into an important contributor to the Dutch economy and a valuable member of Dutch society. Schiedam mayor Cor Lamers said the establishment of BYD in the city supported the positioning of the Rotterdam region "as an attractive area for innovative sustainability companies. This fits the Schiedam profile well." A ceremony has been held in Schiedam, part of the Greater Rotterdam area in the Netherlands, to celebrate BYD Europe's 20th anniversary.